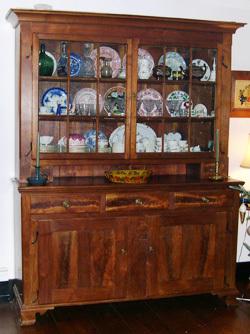 This exemplary Pennsylvania German dining room hutch is an exact duplicate of an original hutch from circa 1760. 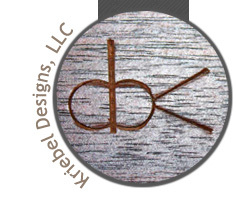 The entire piece is done in carefully selected black walnut to match the old growth wood of the original, and features antique hand blown glass panes, hand forged rat tail hinges, and hand made brass pulls. Through the graceful artistic application of the figured walnut to the drawers and door panels the natural beauty of the grain brings out the character of tree and exemplifies the exquisiteness of this fine recreation. 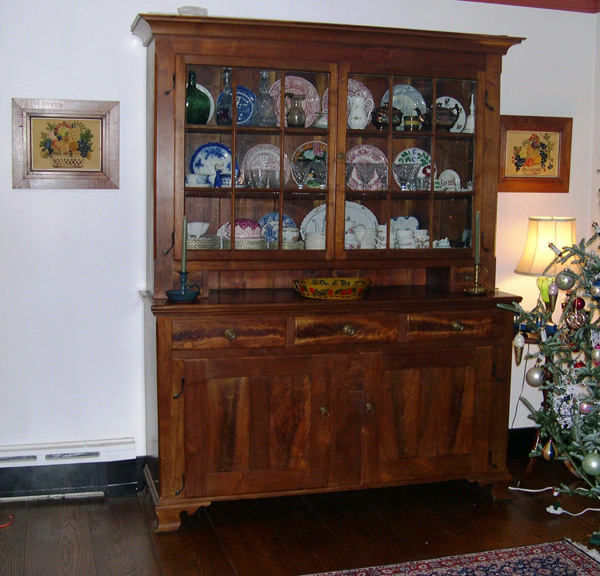 Assiduous craftsmanship in the hand cut dovetails of the drawers, the hand planed drawer bottoms and the pegged mortise and tenon doors accentuate the epitome of one of the finest examples of dining room furniture obtainable today. 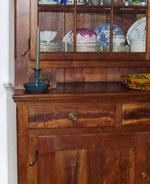 Pegged mortise and tenon doors accentuate his fine example of dining room furniture.